Labradoodle, Goldendoodle, Puggle, and Raggle. You might have heard these names. Well, these are Designer Dog Breeds. Often times, they are also referred as Hybrid Dog Breeds. Today, we share with you 15 Cutest Designer Dog Breeds. Well, a “Designer” Dog is a cross between two purebred dogs. They are all adorable and small dogs. Usually, designer dogs are given a breed name by combining two parents’ breeds. For example, let’s take Labradoodle. A Labradoodle is a cross between a Labrador retriever and a poodle that are both purebred dogs with sought-after qualities. A designer dog possesses certain qualities of both parent breeds. So, when you purchase Labradoodle, you get certain qualities from each of its parent breeds that are Labrador retriever as well as a poodle. Now, let’s know some basic facts about purebred dogs. A purebred dog is bred over many generations to breed true. So, each puppy that is born has the same looks, temperament, and characteristics of the others. It’s usually the case that a standard is written and breeders must adhere to the written standard. So, when you purchase a purebred dog, you are well aware of what you are getting. You know how big your puppy will grow. You know your dog’s traits. You know whether it’s capable of hunting, rescue work, flock guarding, herding, or just being a companion dog. You know whether it’s easy to train. Further up, you know how much exercise the dog will require. In fact, a designer dog has documented purebred ancestry. So, you know for sure what it is. When you go to purchase a dog, ask yourself – Are you ready for a dog? That said, here’s the list of 15 Cutest Designer Dog Breeds. So, when you are out to purchase a designer dog, you will have a good number of options before you and get the cutest designer dog breed for yourself. Labradoodle or Labrapoodle is a designer dog breed (a crossbreed dog) created by crossing the Labrador Retriever and the Standard, Miniature or Toy Poodle. So, Labradoodle is a retriever and a poodle mixed breed dog. The term was first coined in 1955 but got popularized in 1988. This designer dog was originally used as a hypoallergenic guide dog. It still remains a quality that many look for in this designer dog breed. However, now they are not considered a breed by any major breeder organization. Cockapoo is a designer dog breed created by crossing the Cocker Spaniel and a Poodle. It is the result of either the American Cocker Spaniel or English Cocker Spaniel with a Poodle. Cockapoo has been known in the USA since the 1950s. However, Purebred breed associations such as the American Kennel Club do not recognize the Cockapoo. It’s usual for a Cockapoo to have a life-span of 14-18 years. They have a fluffy or scruffy look. Cockapoo is potentially happy and loving mixed breed dogs. A full-grown Cockapoo can weigh anywhere between 10 to 30 pounds. They often maintain their fluffy charm. However, Cockapoo does require extensive grooming. Pitsky is a designer dog breed created by the crossover of Pit Bull and Husky. Pitsky has the strongest traits of each breed. It has the bright light colored eyes of the Husky and their ears too. It has a boxier and sturdy body as that of a Pit Bull. Pitsky is full of energy and loyal to the bone. However, they can be an absolute nightmare in training. They might not be conventionally attractive but are adorable in their own way. This designer dog is a mix of an Australian Shepherd and a Standard Poodle or Toy Poodle that are often known for their intelligence. The Aussiedoodle has every potential to be a canine scholar. It is a cute and adorable designer dog breed. The Aussiedoodle is super-smart and friendly designer dog breed. The Aussiedoodle tends to be quite active. It loves to take a good walk each day. It also needs an active playtime every day. It would be better for you if you give the Aussiedoodle a job to keep him busy. Otherwise, he would find his own ways to keep himself entertained. The Aussiedoodle weighs between 25 and 70 pounds. It can be trained to be a fantastic therapy dog. The Golden Dox is a designer dog breed mixture of Golden Retriever and the little Dachshund. It tends to be a perfect family pet and is very easy to train requiring very little money for dog training schools. Simply grab yourself a Golden Dox if you want an adorable and cute little dog breed all the way through. The Golden Dox is a perfect blend of Golden Retriever and Dachshund. It has a long, low body of a Dachshund mixed with the adorable face and long flowing hair of Golden Retrievers. Seriously, you would simply love to hold a Golden Dox all day and night. The Bassador is a mixture of the lumbering Basset Hound and energetic Labrador Retriever. It’s a designer dog of potentially good-natured and adorable behavior. The Bassador weighs between 50 and 70 pounds. It has a wide range of personalities. They can be calm yet stubborn. They can be very active and always on the hunt. They have a love for food. It has a friendly personality and gets along well with the kids. However, at times, a Bassador can be quite rambunctious for families with toddlers. 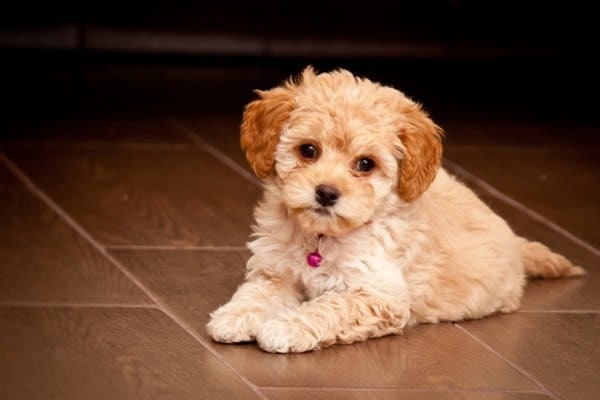 The Maltipoo dog is a cross between a Maltese and a Miniature or Toy Poodle. It’s a cute little dog, clever, affectionate, and playful. Maltipoo retains their puppy-like looks and behavior even when they grow old. They have a curly or scruffy coat which comes in a variety of colors. Usually, they have white or cream colored coat. Maltipoo is known for their fun-loving and affectionate nature. They are quite active and charming as well. They easily fit into all kinds of homes and families, be it apartment or house, elderly single, or family with kids. Maltipoo makes a good watchdog. They weigh about 10 pounds. The Shihpoo is a designer dog breed, a cross between Shih Tzu and a Miniature or Toy Poodle. It may have a curly coat of a Poodle or have the long, straight coat of a Shih Tzu. The Shihpoo has a sturdy body. They weigh between 7 and 20 pounds and have a lifespan of 10 to 15 years. They carry cute and alert expression. Shihpoo comes in various solid colors or even in a particular pattern (a color plus white). They are smart and intelligent but can be stubborn as well. They are quite easy to train, particularly when you are able to motivate them well. They love food rewards. Shihpoo is friendly, lovable, and affectionate. They are courageous and are excellent watchdogs. The Yorkipoo is a “designer” dog breed – a mixed dog breed – cross between the Yorkshire Terrier and Toy Poodle or Miniature. It’s a fun-loving designer dog. Yorkipoo is intelligent, gentle, and affectionate. They make an excellent companion and are perfectly suited for companion life. They are playful and energetic. Barking is their favorite pastime. They are easy to train and are usually quick learners. Yorkipoo weighs about 10 pounds and has a lifespan of 10 to 15 years. They are canine “Superman” in miniature. The Goldendoodle is among the better known of the designer breeds. This designer dog is a cross between the Golden Retriever and the Standard or Miniature Poodle. They come in three sizes: miniature – 15 to 30 pounds, medium – 30 to 45 pounds, and standard – 45 to 100 pounds. Like its parent breeds, Goldendoodle too tends to be smart, outgoing, agile, and quick in learning. They often make a good guide or therapy dog. The Puggle designer dog is a cross between the Pug and the Beagle. The Puggle makes a cute, sturdy, and playful “designer” dog breed. They have a sense of humor and a desire to please. They are people-friendly, enthusiastic, and easily trainable. Puggle make good companion dogs and can be great family dogs. Their activity level range from low to moderate. However, a Puggle can be stubborn and uncooperative at times. A Puggle can weigh anywhere from 15 to 30 pounds. Its lifespan is about 12 to 14 years. This funny and smart designer dog is a cross between the Miniature Schnauzer and the Miniature Poodle. Schnoodle is an agile, active, and adorable hybrid dog breed. They are regarded amongst the most popular designer dog breeds in the world. They are found in many colors. They can weigh anywhere between 6 to 76 pounds and have a lifespan of 12 years. The Schnoodle makes a perfect lap dog and a family dog as well. Schnoodle are usually small dogs. They inherit the Poodle’s willingness to please and the sturdiness and activity of the Schnauzer. Schnoodle love to have fun. They are lovable and playful and always the center of attraction. The Raggle dog is a cross between the Beagle and the Rat Terrier. It’s a small dog with a lifespan of 12 to 15 years. The Raggle is full of agility and competitive obedience. They are very affectionate and cuddly. It is a good watchdog too. Although the Raggle is a small dog, it is very powerful with lots of energy. They are also very intelligent and have a strong hunting instinct. Raggle requires special attention on their training. They are very good family pet. They do well with other dogs. The Raggle can weigh anywhere from 5 to 20 pounds. So, if you are on the lookout for a mixed breed dog that is energetic, active, and obedient, then the Raggle can be a smart choice for you. The German Chow is a cross between the German shepherd and the poufy Chow Chow. They are medium to large sized dogs like the German shepherd with the head shape and fluff of the Chow Chow. It’s a cuddly breed with lots of energy. The German Chow can weigh anywhere from 40 to 95 pounds. They can measure 18 to 26 inches tall. They have a life expectancy of 10 to 12 years. They are smart, intelligent, very loyal, and with full of energy. However, they can be stubborn at times making training a tricky affair. That said, the German Chow is very protective of their owners and family. They tend to be cautious around strangers. The Cheagle is one of the cutest designer dog breeds around. They are a cross between the Chihuahua and the Beagle. Cheagle comes as a tiny breed having the thick body as that of a Beagle and the small size as that of a Chihuahua. They are super energetic, super social, and super playful. They are best as companion dogs for couples, families as well as older people. They also tend to be a good lap dog. They are quite easy to train as well. Their average height ranges from 9 to 14 inches. The Cheagle weighs from 9 to 20 pounds and their lifespan is about 12 years. The Cheagle is a tiny dog with big heart and big personality. We hope that you would have enjoyed this presentation on 15 Cutest Designer Dog Breeds. We love your comments and suggestions, and please do share the post with your friends and loved ones.